The Titans Cronus had been prophesied that one of his children would dethrone him. So he ate up all the children, who bore him his wife Rhea. Rhea was very sad, but she did not want to part with Kronos and became pregnant again. Their children were immortal gods live forever. So Rhea's children continued to live in the belly of her father Kronos. One day saw Rhea, she was pregnant again and decided to hide. She fled to the island of Crete. There they hid in a cave on Mount Ida. Kronos was very quickly suspicious and searched everywhere for her. Rhea gave birth to the child Zeus, but after a few days Kronos stood front of the cave and demanded that it Rhea surrendering the child. Rhea gave him a bloody wound in diapers stone that Kronos immediately devoured. Then he demanded that Rhea came away with him. She accompanied him for a while, then she pretended still weak from birth to be and let Kronos precede. Then she ran back. Near the cave some nymphs were playing and they heard the child crying. Immediately they went into the cave. When Rhea came back a nymph had the child littel Zeus in her arms. She asked the to look after her son Zeus. 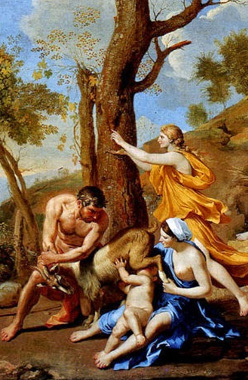 Rea transformed the nymph into a nymph divine goat so she could feed the baby with milk, ambrosia and nectar. The beautiful white goat called Amalthea, which in Greek means "divine white goat". The goat was nursing the child with her milk. From their horns drank Zeus nectar and ambrosia. In addition, a swarm of bees brought the baby mountain honey.